My parents-in-law liked to keep the letters they wrote to each other. When they died there were several boxes of them, the first written in 1932, the innocent flirtations of an eighteen year old girl to a seventeen year old boy, the last in 1946, from an army officer to the wife he had been separated from for five years. And here it is: the story of John and Janie Askew, an ordinary couple living through extraordinary times. They could be your parents or grandparents: the innocent courtship in the 1930’s, marriage and settling down to family life, then the hardship and separation through war. 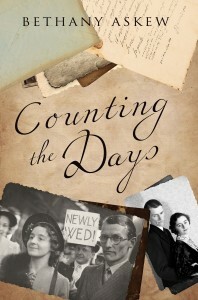 A unique insight into life in England and on active service overseas during World War Two and the story of a love that crossed counties and continents and went on to last a lifetime. Thank you for your comment on my website. I would love to come and give my talk to your W.I. on 14th April. The talk includes photographs. Do you have a projector and screen? I would need to check compatibility with my laptop prior to the talk as this has been an issue in the past!